Unsaturated Polyester Resins: Blends, Interpenetrating Polymer Networks, Composites, and Nanocomposites explains the preparation, techniques and applications relating to the use of unsaturated polyester resin systems for blends, interpenetrating polymer networks (IPNs), gels, composites and nanocomposites, enabling readers to understand and utilize the improved material properties that UPRs facilitate. 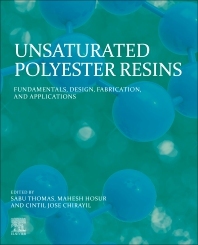 Chapters cover unsaturated polyester resins and their interaction at the macro, micro and nano levels, in-depth studies on the properties and analysis of UPR based materials, and the applications of UPR based composites, blends, IPNs and gels across a range of advanced commercial and industrial fields. This is a highly detailed source of information on unsaturated polyester resins, supporting academics, researchers and postgraduate students working with UPRs, polyesters, polymeric or composite materials, polymer chemistry, polymer physics, and materials science, as well as scientists, R&D professionals and engineers in industry. Dr. Mahesh Hosur is Interim Head and Professor at the Materials Science and Engineering Department, Tuskegee University, USA. He served as Honb. Director of NSF-EPSCoR (National Science Foundation – Established Program to Stimulate Competitive Research), working on projects such as Enhancing Alabama’s Research Capability in Nano/Bio Science and Sensors (2011-2015), the Alabama Center for Nanostructured Materials (2005-2010), and the Center of Excellence in Nanobiomaterials, derived from Biorenewable and Waste Resources (2011-2016). Prof. Hosur’s research group covers specialized areas of polymers, including processing, process sensing, low-cost manufacturing using RTM, VARIM processes, static and dynamic characterization, fatigue and fracture, structural analysis, evaluation, and the processing and characterization of biopolymer and polymer nanocomposites. Dr. Cintil Jose Chirayil is Assistant Professor at the Department of Chemistry, Newman College, Kerala, India. Dr. Chirayil received her Ph.D. in Polymer Science from Mahatma Gandhi University, India, and completed a post-doctoral fellowship at the Centre for Advanced Materials, Qatar University, Doha. Dr. Chirayil is actively involved in cutting-edge research in polymeric materials, including enzymatic and chemical modification and characterization, surface groups, cellulose membranes, polysaccharides, and unsaturated polyester.